Image via atomicrobotics.comA competition may raise thoughts of touchdowns, squeaky courts and a pitcher’s mound, but for the Atomic Robotics, it’s all about engineering. The community 4-H club was started in 2011 as an opportunity to introduce Philadelphia students to career opportunities in science, math, engineering and technology. 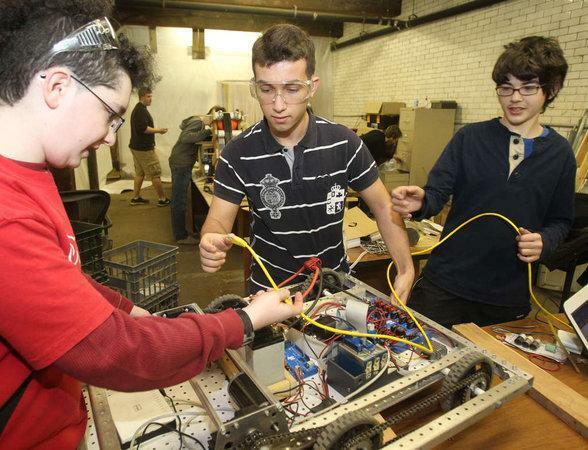 The club works with teachers, mentors and engineers to build 120-pound robots. Along with hands-on experience, students have the opportunity to apply for grants and college scholarships through the major robotics nonprofit FIRST (For Inspiration and Recognition of Science and Technology). This April, the high school team is hoping to compete in the FIRST (For Inspiration and Recognition of Science and Technology) Robotics World Championship in St. Louis. To fundraise, the team is selling LED light bulbs. LEDs conserve energy and cut down on costs by using 20 to 25 percent less energy than incandescents. Money raised from the light bulb sales will assist with funding for the program and scholarships to universities.